To access the Preferences panel, click the Preferences tab in the PressForward menu. Users can control aspects of the content display in the All Content and Nominated pages by setting preferences here. Infinite Scroll Active: When this box is checked, users can scroll through content continuously. Infinite scroll is on by default. Show side menu: When this box is checked, a menu that includes a list of feeds with alerts displays on the right side of the All Content and Nominated panels. This option is turned off by default. Number of feed items per page: Setting this number determines how many items will appear on the All Content and Nominated panels when infinite scroll is turned off. 20 items per page is the default. These preferences are available only to users with administrator privileges in PressForward. Options set on this page will determine behavior across the site as a whole. Opt-in to allow us to collect non-sensitive diagnostic information? Users will be prompted to opt-in or opt-out upon update to version 5.0 of PressForward. This prefrence can be updated anytime through the Site Options tab in Preferences. Seconds to redirect user to source: 0 means no redirect. PressForward makes use of canonical URLs. If you would like to redirect your readers automatically to the items aggregated by the feed reader and published to your site, this setting will determine how long to wait before redirecting. The default setting is 0 seconds. The redirect setting can be manually overridden in the Edit Post page by editing the forwarding status in the publish box. Use advanced user role management? : This option may be needed if you customize user roles or capabilities within your WordPress install. For sites that manage multiple users using special plugins, administrators can use this option to insure PressForward respects customized user roles and capacities. See the Wordpress documentation for more information on user roles. This is off by default. Email notifications for nominations: To receive email notifications when an item has been nominated, enter a comma separated list of email addresses here. If left blank, no emails will be sent. Show item author as source: When this preference is on, the name of the author in a PressFoward item will appear in the item_author custom field when the item is drafted. This author will overwrite the creator of the post. This is on by default. Turn alerts on: By default this option is on. When alerts are on, feeds that continually return errors display as alerted. You can dismiss alerts in the Subscribed Feeds panel. Months to retrieve and retain feed items: This number determines the number of months that items aggregated by the PressForward feed reader will remain visible in All Content. This is set to 2 months by default. Number of errors before a feed is marked as malfunctioning: Feeds sometimes respond slowly or have errors that cause them to be unreadable. This setting determines the number of consecutive errors PressForward will allow from a feed before creating an alert and disabling it. The default is 3 errors. Minutes between feed retrieval cycles: This setting is the frequency at which PressForward will attempt to start the process of retrieving all the feeds your list. Warning: if you have a large number of feeds this setting should not go below 30 minutes. Post status for new content: This setting allows you to set a default post status that gets set when you send nominations to become posts. Options include: Published, Privates, Draft, or Pending Review. See the WordPress documentation for more information on each post status. Post type for new content: This setting allows you to set a default post status that gets set when you send nominations to become posts. The default WordPress post types are: Posts, Pages, and Media. Any custom post types will also appear here. For more information on post types see the WordPress documentation. 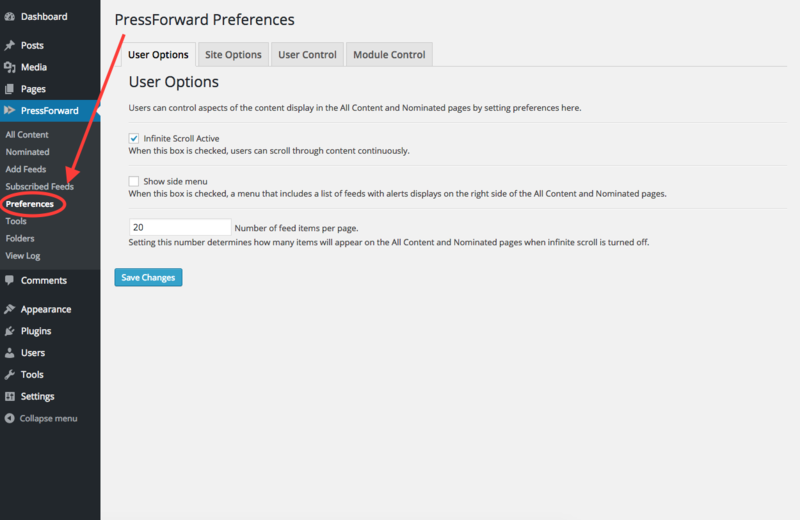 These preferences determine the type of access granted to each user role within the PressForward plugin. The user roles allowed by PressForward in order of most restrictive to least restrictive include: administrator, editor, contributor, and subscriber. These are based on the default WordPress user roles. For more information on customizing user roles refer to the WordPress documentation. PressForward Menu Group: This sets the user role required in order to access the PressForward plugin from the WordPress Dashboard. This is set to contributor by default. All Content Menu: This sets the user role required to see items in All Content. This is set to contributor by default. Nominated Menu: This sets the user role required to see items in Nominated. This is set to contributor by default. Non-User Preference Tabs: This sets the user role required to access the Site Options, User Control, and Module Control preferences in the Preferences panel. This is set to administrator by default. Feeder Menu: This sets the user role required to access the Add Feeds and Subscribed Feeds panels. This is set to editor by default. Internal Commenting Feature: This sets the user role required to be able to add comments in All Content, Nominated, and Reader View. Comments are not publicly visible when an item is moved to draft status in the WordPress Posts menu. This is set to contributor by default. Debugging Log: Debugging sets the user role required to access the debugging log (View Log) from the PressForward menu when it is turned on. This is set to administrator by default. PressForward modules are add-ons to alter or improve the functionality of the plugin. Internal Commenting: This module provides a way for users to comment on posts throughout the editorial process. This module is on by default. Debugger Log Viewing Module: This module provides a way to view the feed retrieval log within the WordPress Dashboard. This module is on by default. Foo Test Module: This module provides a set of test functions for developers to check. This module is off by default. RSS Import Module: This module provides the core functionality to read RSS feeds and translate them into PressForward&apos;s system. This module is on by default. RSS Output Module: This module provides a way to output RSS feeds from your subscribed items. An RSS feed consisting of all your subscribed items will be available at your domain "/feedforward." This module is on by default.